In one of the quirks of Bond history, the classic pose of Sean Connery as James Bond holding a gun beside his face is not all it may appear. Dedicated fans will know that the weapon pictured is not 007's preferred PPK. 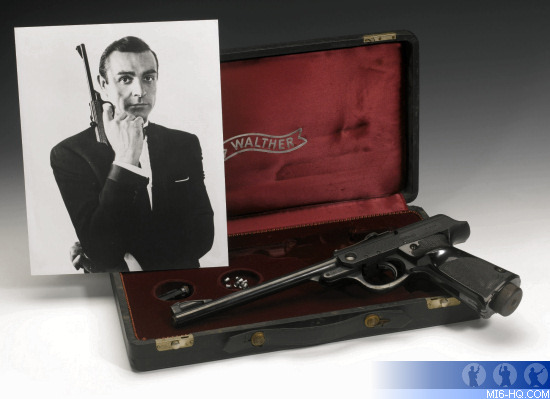 For the second James Bond film, "From Russia with Love", it was decided to shoot a publicity image of Connery with his Walther pistol. The publicist Tom Carlile devised a series of poses and the photographer David Hurn was commissioned for the photo shoot. When Connery arrived at the photo studio, together with Tom Carlile and representatives from United Artists, it was discovered that nobody had brought James Bond’s small Walther automatic pistol. Hurn recalled that "by chance it happened that I practised air pistol target shooting as a hobby and the pistol I used was a Walther. It was decided between Tom and myself, that... we would use my pistol for the pictures and presumed that should anyone have doubts on their seeing the name Walther on the gun they would be reassured..."
"In theory Tom should have had the long barrel of the air pistol removed by airbrushing during the designing of the actual poster – in practice, for reasons, unknown, this was never done." The series of publicity shots was used for From Russia with Love (1963) and then the following three films: "Goldfinger", "Thunderball" and "You Only Live Twice". 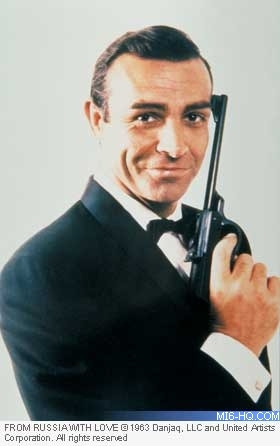 Hurn notes that "the picture of Sean Connery holding the gun across his chest or alongside his face became the most famous of all Bond images". It was also used to recreate a digital 007 in the 2005 videogame "From Russia With Love". Above: Walther air pistol, LP Model 53, serial number 054159, 24cm barrel with black finish, manufacturer’s fitted presentation case with sight elements, some minor marks. The pistol has changed hands in the collectors market a few times in recent years. Back in 2001 it sold for just £14,100. But most notably in November 2010 it sold at auction at Christie’s South Kensington for an eye-watering £277,250 (it was only estimated to sell for £15,000 - £20,000). At the time the buyer was unknown, but film director Michael Winner has come forward as the guy who splashed out over a quarter of a million pounds on the pop culture treasure. Now diagnosed with a terminal illness, Winner put all of his collection up for auction at Sotheby's in London this month, along with the famous pistol. When the hammer came down on 12th December 2012, the winning bid was £121,250, less than half of what it had sold for two years earlier.